For added punch in America, replace the word "great" with "exceptional...."
GDP also does not fully account for humanitarian disasters to poorer countries. Extreme impacts in poor, tropical areas (which are expected to be the first to experience the most severe disasters) may not significantly affect global GDP because of the low standard of living – but they still matter. The GDP of the poorest 20 countries in Africa is 0.12% of world GDP (in 2011). That's hardly a blip on charts like this, but if a disaster totally obligerated these 20 countries it would be almost undescribable. And, sure enough, logging above the area of the current landslide appears to have gone beyond the legal limits, into the area that slid, according to a report in The Seattle Times. Yes, but who wants to listen to warnings by pesky scientists, to pay heed to predictions by environmental nags, or allow an intrusive government to limit private property rights? That’s how these issues get cast. And that’s why reports like the ones done on the Stillaguamish get shelved. The people living near Oso say nobody ever informed them of the past predictions. From "An improved mass budget for the Greenland ice sheet," Ellyn M. Enderlin et al, Geophysical Research Letters Volume 41, Issue 3, pages 866–872, 16 February 2014. In the graph below, the black line is overall ice mass lost in Greenland; the blue line is loss to due to ice discharge from marine-terminating outlet glaciers; and the red line is loss due to surface melting and runoff. 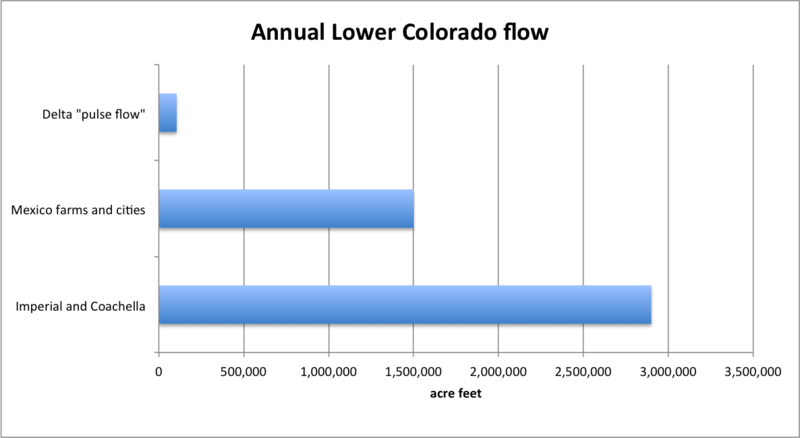 Over the course of last decade, surface melting and runoff moved to dominating over discharge. The authors write, "...84% of the increase in mass loss after 2009 was due to increased surface runoff. These observations support recent model projections that surface mass balance, rather than ice dynamics, will dominate the ice sheet’s contribution to 21st century sea level rise." There's more to life than climate change -- such as the genuine scientific revolution going on with the discovery of exoplanets. I have a feature article about them, and some of their properties, in the April issue of Physics World magazine. I don't have any special information about the Pielke Jr/Mann/Trenberth dust-up.... The third of the five stages of grief is "bargaining," and I suppose that's the phase climate change is in now, with all the threats of lawsuits flying around (and the actual lawsuits). I like all three of these guys, and have used them often for sources. And I still hope to. But, in my opinion, this latest incident is nothing compared to Roger's accusations last year about Shaun Marcott and his co-authors, where he outright accused them of fraud for, as far as I can tell, merely presenting two pieces of information on the same graph. I thought that was very far beyond the pale, and much more egregious than this latest. So when he writes, as Talking Points Memo reported, "...in the future how about we agree to disagree over scientific topics like gentlemen?," it rings kind of hollow. Recently someone -- I forget who -- said about Roger that he seems to think climate change is a big problem, but he disagrees with everything anyone says about it. I feel like I kind of get that in a way -- it can be much more interesting to go slightly against the grain, to find a special angle that stands out. It gets you more attention, and it makes you look like an "honest broker" compared to all the...well, compared to all the lemmings. But it's a difficult position to consistently pull off over the long-term, and it's easy to become obstinate just for the sake of being obstinate. That's not a comfortable position to be in. The last year or two seems like a really ugly time in climate science, and in the writing and blogging about it. There is a lot at stake, not just scientifically and professionally but historically as well, and when once Newton and Leibniz could have a calm, leisurely feud in correspondence and journal papers, today it happens almost faster than you can read and maybe faster than people can think. It's easy to get caught up in it, which I've certainly been guilty of. It's easy to forget that this is a problem that will be unfolding for many decades, and even centuries, and in a real sense we're only in the beginning of it. Or maybe the end of the beginning. But lately it seems like a lot of people are telling other people to just shut up, they're wrong or even liars, and I suspect this is only going to get worse -- perhaps much worse. Anyway, the Singularity will be here before you know it, and I suspect that as soon as a computer system becomes intelligent enough to keep exponentially improving itself, one of the very first things it will do is shut down all of our CO2-emitting power plants and motor vehicles, because it's not an idiot like we are. 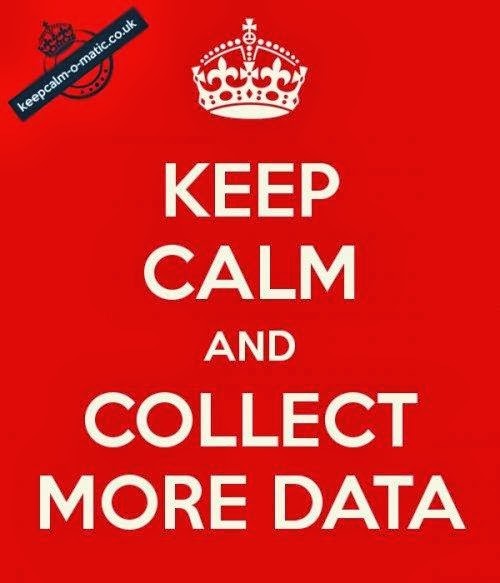 I guess the saying is ultimately right -- keep calm and collect more data. What else is there, really? Climate science is a religion, some say, with scientists toeing the party line, nothing but slimy leftists intent on world control, only looking for funding of their next grant proposal. Science is always skeptical, others way. It is a critical, open endeavor, a self-correcting process that hones in on the harsh and inconvenient truth. 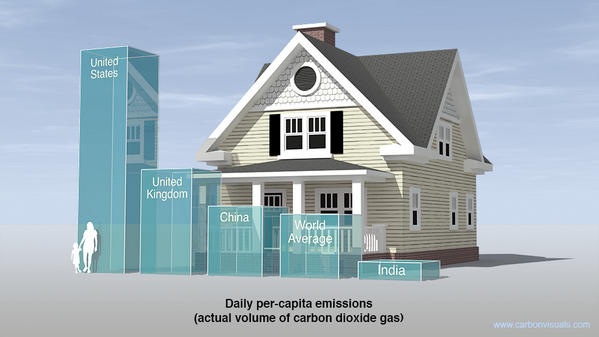 The second part of the IPCC's new assessment report is due to be presented next Monday in Yokohama, Japan. On the one hand, a classified draft of the report notes that a further "increased extinction risk for a substantial number of species during and beyond the 21st century" is to be expected. On the other hand, the IPCC admits that there is no evidence climate change has led to even a single species becoming extinct thus far. At most, the draft report says, climate change may have played a role in the disappearance of a few amphibians, fresh water fish and mollusks. Yet even the icons of catastrophic global warming, the polar bears, are doing surprisingly well. Their population has remained stable despite the shrinking of the Arctic ice cap. The draft report includes a surprising admission by the IPCC -- that it doubts its own computer simulations for species extinctions. "There is very little confidence that models currently predict extinction risk accurately," the report notes. Very low extinction rates despite considerable climate variability during past hundreds of thousands of years have led to concern that "forecasts for very high extinction rates due entirely to climate change may be overestimated." In the last assessment report, Climate Change 2007, the IPCC predicted that 20 to 30 percent of all animal and plant species faced a high risk for extinction should average global temperatures rise by 2 to 3 degrees Celsius (3.6 to 5 degrees Fahrenheit). The current draft report says that scientific uncertainties have "become more apparent" since 2007. "Even in the ocean, we see that habitats are shifting to the north," says another leading IPCC author, Hans-Otto Pörtner of the Alfred Wegener Institute of the Helmholtz Centre for Polar and Marine Research. The Norwegians were pleased about the many new species of fish off their coast. Fifty-two new species were also counted in the North Sea. But, Pörtner says, "near the equator, there is nothing to replace what has gone. The seas are becoming impoverished there." Let it not be said that climate scientists aren't trying to get at the truth. "Two prominent climate scientists say Roger Pielke Jr., a controversial writer at Nate Silver’s FiveThirtyEight site, sent emails threatening possible legal action in response to their criticism of his findings for the data-driven news site. "Pielke says it's "ridiculous" to characterize the emails as threats against Michael Mann, director of the Earth System Science Center at Pennsylvania State University, and Dr. Kevin Trenberth, a distinguished senior climate scientist at the National Center for Atmospheric Research. FiveThirtyEight, however, apologized to both men." Mann declined to make Pielke's email public, but told HuffPost that he viewed it as a "thinly veiled" threat of legal action. In an email to HuffPost, Trenberth said Pielke contacted him and his bosses following the ThinkProgress report. Trenberth said he also received an apology from FiveThirtyEight. “He was very accusatory and threatened me if I did not respond,” Trenberth told HuffPost. Trenberth forwarded the text of the email to HuffPost. Pielke wrote that Trenberth had "made some pretty coarse and perhaps even libelous comments" in the ThinkProgress article. Pielke requested that Trenberth correct his public claims and noted that "an apology would be nice also." "Once again, I am formally asking you for a public correction and apology," Pielke wrote to Trenberth and his bosses. "If that is not forthcoming I will be pursuing this further. More generally, in the future how about we agree to disagree over scientific topics like gentlemen?" Speaking of drought, John Fleck is on a field trip along the Colorado River, blogging up a storm, flooding the zone and getting his feet wet in all kinds of puddles. Here's his remarkable picture of the Colorado River just below the Morelos Dam, which was opened recently for an environmental experiment in the former wetlands of the river's delta. Here are some of John's many thoughts on that, and here he puts this pulse flow into its context. All of his recent posts have trenchant observations that are worth checking out. Why should you care, if you don't live in the US southwest? Because when they run out of water in the next couple of decades, they will be coming to you asking for some of yours. John Fleck tweeted this picture of the Morelos Dam on the US-Mexican border being opened today, spreading water into the Colorado River basin. Science magazine had an interesting article this week from Erik Stokstad about this. Stokstad wrote that the Dam will be open for almost 2 months. But the amount of water is "just 0.7% of the 18.5 billion cubic meters that once reached the gulf each year, mostly as spring floods." "Just 3% of the original extent of cottonwood and willow trees remains." 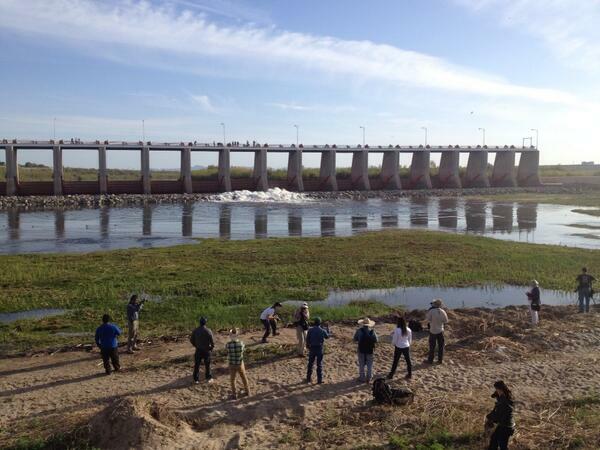 The maximum flow of the outlet will be 120 cubic meters per second, and that will last only for 3 days. "The river will probably be no more than hip-deep in places." "About 2 dozen scientists, plus graduate students and volunteers, have spent the past several weeks studying the river channel." The outflow will end on May 18th. "Smaller flows will continue even after May. That's because a coalition of six environmental groups has raised about $7.5 million to plant trees and start buying up to 65 million cubic meters of water from Mexican farmers, so it will reach the riverside vegetation rather than be used for agriculture." 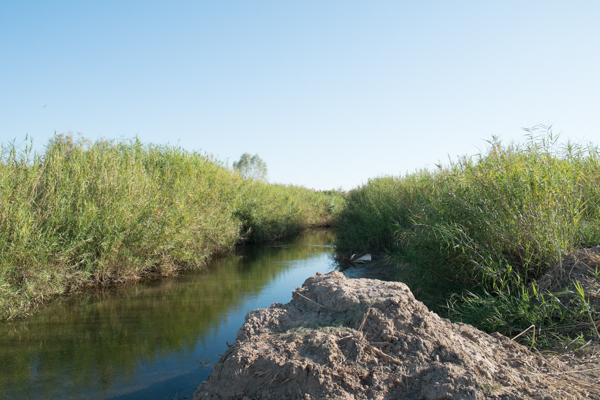 "When the influential American conservationist Aldo Leopold canoed down the Colorado River delta to the Gulf of California in 1922, he was awestruck by endless wetlands teeming with wildlife. Leopold vowed to never return, fearing that the wilderness wouldn't live up to his memories. He was right...."
Addendum: Nature magazine wrote about this too. The three-day pulse will be March 27-29, "meant to mimic a small-scale spring flood." As I have pointed out a number of times, Mann doesn’t even need discovery to show reckless disregard for truth/falsity in Steyn’s case. Steyn went on record recently calling the Hockey Stick a “climate model” whose “predictions” had failed. What possible defense can he have against the claim that he showed reckless disregard for the truth or falsity of claims that Mann’s work was “fraudulent”, when he didn’t even know what the %$@! that work was? Be absolutely sure to read Tamino's analysis of Hansen's 1988 climate predictions -- and his takedown of the shamefully dishonest presentation of the GWPF (Global Warming Policy Foundation). 14 earthquakes recorded in Oklahoma since Friday. Argus et al in GRL: California's mountains subside up to 12 mm in the fall and winter due to the load of snow and rain, then rise an identical amount in the spring and summer when the snow melts, the rain runs off, and soil moisture evaporates. We invert the GPS observations of seasonal vertical motions to infer changes in equivalent water thickness. Did you know that Andrew Weaver, a climate scientist from the University of Victoria in British Columbia who co-authored this Nature article on the tar sands that I've referred to often, was elected last year to the province's parliament as a member of the Green Party? Judith Curry thinks that Arctic sea ice is going to reverse its decline around 2030: "As per the stadium wave, the natural variability part of the sea ice decline (arguably at least half of the total sea ice decline) will bottom out circa 2030, with the reversal of the decline beginning in the European sector." That's hardly what models predict. And I noticed something else: the audience’s eyes glazed over as the endless list of disasters were described. And the climate policy advocates provided extraordinarily specific predictions–such as the snow pack being reduced by 35% by a certain year. Such extreme precision regarding events later in the century caused such substantial rolling of some eyeballs that I worried that some might fall out their sockets. Such litanies of future global warming-related disasters are being repeated time and time again on the national scene, leading much of society to increasingly tune out the increasingly strident warnings of global warming impacts provided by the "prophets" in non-governmental organizations (NGOs), the media, and others. In fact, according to a recent Gallup poll, climate change has dropped to 14th of the list of Americans' worries." It's not often that the very first line of an article is outright wrong, but John Hinderaker manages it at Powerline, which Mark Steyn gleefully reposts. Climate alarmism is not based on empirical observation; rather, it is entirely predicated on computer models that are manipulated to generate predictions of significant global warming as a result of increased concentrations of CO2. They conclude, "A growing body of evidence supports an ESS often exceeding 6°C during glacial times and 3°C during non-glacial times." Hansen, J.E., and M. Sato, 2012: Paleoclimate implications for human-made climate change. In Climate Change: Inferences from Paleoclimate and Regional Aspects. A. Berger, F. Mesinger, and D. Šijački, Eds. Springer, 21-48, doi:10.1007/978-3-7091-0973-1_2. Rohling, E.J., et al, 2012: Making sense of palaeoclimate sensitivity. Nature, 491, 683-691, doi:10.1038/nature11574. "Understanding Earth's Deep Past: Lessons for Our Climate Future," Committee on the Importance of Deep-Time Geologic Records for Understanding Climate Change Impacts; National Research Council of the National Academies (2011). In the case of climate models, we know they are wrong: they don’t accurately reproduce the past, which should be the easy part. Here the solid black line is the average global surface temperatures from HadCRUT4, the dashed line the same from GISS, and the solid red line the CMIP5 model mean. Hinderaker lauds Tim Ball's views on climate models... So how well does Tim Ball's climate model do? Oh, that's right, Tim Ball has never made a climate model in his life (I can't think of one contrarian who ever has), and his highly padded publication list seems to contain perhaps 4 peer reviewed articles in an almost 30-year career. That's what passes for an expert in Powerline Land. Hinderaker clearly lives in the same subuniverse as Steyn -- climate science is wrong, BECAUSE HE SAYS SO. There's no need to understand or evaluate the science, because IT'S WRONG. So you can say anything you want about the science and about the people creating it, literally anything, regardless of its truth or untruth, because IT'S ALL WRONG -- and his readers don't want to hear any differently anyway. What an absolute failure of reason and of intellect. "Growth Can't Go On," and "What does it mean to be anti-growth?" A related question is, why isn't growth ever good enough? When will the U.S. be rich enough to pay for clean and sustainable energy, instead of treating the atmosphere as a waste dump for CO2? The figure here is a graph of U.S. real per capita GDP -- Gross Domestic Product corrected for inflation, per person in the country. It's in units of 1/1,000,000 dollars, but you can multiply. In 1960, real per capita GDP was $17,205, in 2009-dollars. In 2013, it was $49,825, also in 2009-dollars -- 2.86 times larger. It has just about tripled since 1960. Now, 1960 wasn't a terrible time in the U.S. People weren't starving. They weren't hudding in shantytowns, begging for food or warmth or an education. By no means was everything perfect -- far from it. But it's wasn't a bad life, certainly not as far as human history was concerned. And what was bad was mostly a matter of hard human hearts, and not money per se. After all, they had money to go to the moon and to fight a war. Few people knew about the dangers of CO2 then -- though some did -- but if you would have asked them to pay for clean, renewable energy, what might have been their response? They might well have said, gee, that's a nice idea, but you know, we just really can't afford it right now. Life is expensive and we have lots of bills and a government to support, but we just can't afford not to use cheap coal and cheap oil and cheap gasoline, wherever we can find them. But, they will say...our decendants will surely be wealthier than we are, so why don't you ask them to sacrifice? They'll be able to afford it. And they would have been right -- their descendants were much wealthier than them, real per capita wealth having increased by an average of 2.0% per year from then to now. Which brings us to 2014. Real GDP is almost three times higher, per person. And yet most of us are hardly more willing to pay for our pollution than were people in 1960 -- even though we are far richer than they were, and we now know far more about pollution and its consequences. Yet we still complain that we can't afford it. We still insist that future generations will be much richer than we are, and they can afford to pay for clean energy. But not us. But why won't they, in the year 2065 or 2070, be saying the same things we are today? If we can't pay for clean, sustainable energy now -- when we're 3 times richer than our people were two generations ago -- why should they be able to pay for it then? Won't they be in the same predicament we are now, paying for ever more expensive medical tests and treatments in order to live a few years longer (can't blame them), and to buy their iHologram phones and satellite-driven cars and endless batteries for the robot that will clean their house and cook their dinner? So when does it end, if not now? P.S. I buy 100% carbon offsets from my electric power company. It costs me an average of $1.86 per month. The mathematician speaking is Edward Frankel of UC Berkeley, and he has an interesting and nuanced view of what such sums mean -- and he gives a shout out to physicists, who don't care what they mean as long as they give the right answers... and they do!. An open thread for comments, most for this Twitter dude who thinks the rise in CO2 since the Industrial Revolution is 95% natural. (I can't justify polluting my Twitter feed any more correcting somone's basic errors, so the conversation can continue here instead.) Science shouldn't be investigated in 140 characters anyway. I have an article that just went up on the Yale Forum on Climate Change & the Media, about some of the surprises and puzzles regarding polar sea ice. "Climate experts believe the next ice age is on its way.... According to some climatologists, within a lifetime we might be living in the next ice age." Well, maybe some of thought a next ice age might be on its way (though there was no consensus). Some of them thought otherwise, as this list of global warming papers since 1827 shows. "In Search Of" was a popular TV show at the time, but not exactly known for its scientific accuracy or skepticism. After all, they did shows on, among other things, Bigfoot, The Bermuda Triangle, Atlantis, and Dracula. P.S. - In high school I went on a field trip to Pittsburgh to see Leonard Nimoy in Twelfth Night. It was theatre in the round, and at one point as he ventured into and around the audience speaking his part (Malvolio), he sat down in the seat just next to me. Which was kind of thrilling, him being Spock and all. And here (!) is an article in the Pittsburgh Post-Gazette about Nimoy's performance there. Stephens: During winter time temperature inversions, Salt Lake City can record CO2 levels of up to 600 ppm. Keeling: "We're not in a position to reverse the [CO2] trend anytime soon." Stephens: It's important to keep multiple CO2 monitoring stations going because (1) science relies on replication, and (2) it has often been the data-takers who, puzzling over unexpected readings, have pointed the way to new insights and findings in the Earth's carbon cycle. Just as Mauna Loa goes over 400 ppm, Ralph Keeling is featured in a Webcast today held by the Yale Forum. 3 pm Eastern Time, 12 pm on the West Coast. Britton Stephens is also participating, and Bruce Lieberman is hosting. They're taking questions by email. As you might know, the Mauna Loa observing station is being threatened by budget cuts. Which is nearly inexplicable -- the atmospheric CO2 content may be the most important number on the planet. Imagine if Dow Jones stopped monitoring the stock market. CO2 at Mauna Loa is already over 400 ppm. Last year this barely happened, and only at the anual peak (when the planet's vegetation is at its minimum). This year it should peak at about 401.5 to 402.5 ppm, and since the annual cycle varies by about 6-7 ppm top-to-bottom, MLO CO2 will be permanently above 400 ppm in about 2 more years. Unless they get those CO2-sucking machines working. (Then find a place to put it all.) For sale: 30 billion tons of carbon dioxide. Lightly used. Buyer must arrange for transportation. If Republicans win control of the Senate this fall, James Inhofe says he will be chair of the environmental committee. 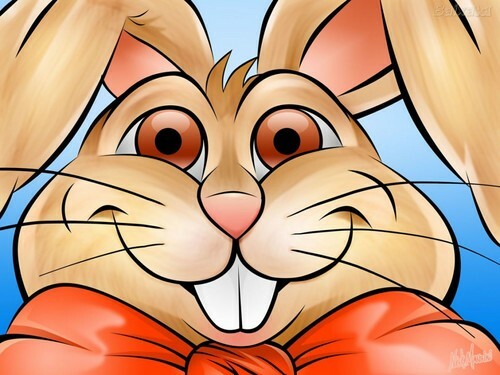 Also, the Easter Bunny is slated to lead the Committee on Agriculture, Nutrition, and Forestry. Because it makes just as much sense. The Tulsa World reports that Inhofe took questions at a gathering of Tulsa Port of Catoosa tenants. Unabashedly, Inhofe blamed just about every problem presented him by port tenants on the Obama administration. "I forget your question, but that's the answer," he said at one point. Inhofe will be 80 years old this November. "Everyone, sooner or later, sits down to a banquet of consequences." From a tweet by Adam Nieman, replying to the Ken Caldeira tweet "CO2 is the waste we produce most prodigiously." Justin Gillis has more at the New York Times. Hard to imagine one more report will do anything, but at least history will know who not to blame. Whoa, this is interesting -- the guy who wrote the Friday article in Guardian about a study climing an "irreversal collapse" of industrial society -- -- Nafeez Ahmed -- is apparently a 9/11 truther and conspiracy nut. He seems to be deleting blog pages from his past, such as this one which Robert Wilson says was about 9/11 conspiracies. Here's Google's cache. Manmade climate change -- it's no longer just the deniers you have to worry about. By the way, this model, by Motesharrei et al, is not very sophisticated at all. It only consists of four simple equations: two that describe a predator-prey relationship between "Elites" and "Commoners," one for the natural resources of "Nature," and one for accumulated "Wealth." 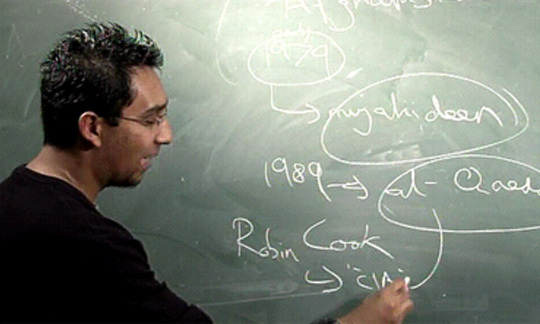 and point to the collapses of Roman civilization, Easter Island, the Mayan civilization, etc as proof of their solutions. But couldn't one ask, why has western civilization, or at least Europe, lasted so long -- about 700 years now, if you go by the start of the Renaissance? The Mount Ashland ski area in southern Oregon announced it has cancelled its entire season, for the first time in their fifty-year history. Ordinarily, the mountain would support 130 paid staff and about 60 volunteers. In contrast, the staff has been reduced to four -- each working only part-time. ....One ski shop owner says he’s doing about 5 to 10 percent of his normal sales. But this is the only ski resort in Oregon and Washington not to open this year. The ski & snowboard industry in Oregon was worth $482 million in 2010-2011, or 0.3% of Oregon's GDP. Speaking of CO2 fertilization, a paper in today's Nature Climate Change finds that that "global warming of only 2°C will be detrimental to crops in temperate and tropical regions, with reduced yields from the 2030s onwards," which the author says is "much earlier than expected." They project decreases of over 25% by the second half of this century. (What does the universe know about pi, anyway? Well....) It's not there by anyone's fault, really, just because of the rather simple way Newton defined "G," as the proportionality constant in the gravitational force between two point masses -- and you can't really blame him for that, because anyone would have done the same. Glenn Greenwald writes that the NSA has infected millions of computers with malware, and send out spam containing malware, to extract files from hard drives. Our government. Nice. That's hardly all the IPCC has to say about plants under higher CO2 and climate change; it's worth reading the FAR's entire section 10.2 to see all the many issues and questions that were raised even then. Nor is this CATO study the first; there have been studies before showing this; CO2's fertilization effect is hardly a surprise or unexpected. But is this greening an obviously good thing? No. greening lowers the albedo of the planet, a positive feedback on global warming. Such changes can have signficant impacts on climate, as Roger Pielke Sr has often pointed out. although a given plant may use less water as CO2 increases -- which also has effects on ecosystems, such as changing soil moisture and higher runoff -- more plants require more water, at a time when humans already use more than 50% of the world's complement of freshwater. CO2-fertilized plants extract more minerals from soil. weeds are plants too, and they compete with crops. more CO2 means, of course, higher temperatures, with accompanying changes in precipitaiton patterns, evapotranspiration, soil moisture, etc. that also affect plants. In fact, a 2007 study found evidence that warming is counteracting the CO2-fertilization effect for some major crops: “Global scale climate–crop yield relationships and the impacts of recent warming,” David B Lobell and Christopher B Field, Environ. Res. Lett. 2 (2007) 014002 http://iopscience.iop.org/1748-9326/2/1/014002. elevated CO2 reduces the quality of plant tissues: "Elevated CO2 reduces the nitrogen concentration of plant tissues," M. Francesca Cotrufo et al, Global Change Biology, Volume 4, Issue 1, pages 43–54, January 1998 http://onlinelibrary.wiley.com/doi/10.1046/j.1365-2486.1998.00101.x/abstract. This changes the nutritional value of plants, for insect herbivores and for humans. The Duke Free-air CO2 enrichment (FACE) experiment found evidence that growth due to enhanced CO2 was limited by nitrogen availability. Plants on planet Earth were doing just fine before the Industrial Revolution (except for maybe trees in North America and Europe, which were decimated by man for fuel and building materials.) How they respond to enhanced CO2 is complicated, and hardly the unalloyed good deniers are trying to make it out to be. Current evidence suggests that that the concentrations of atmospheric CO2 predicted for the year 2100 will have major implications for plant physiology and growth. Under elevated CO2 most plant species show higher rates of photosynthesis, increased growth, decreased water use and lowered tissue concentrations of nitrogen and protein. Rising CO2 over the next century is likely to affect both agricultural production and food quality. The effects of elevated CO2 are not uniform; some species, particularly those that utilize the C4 variant of photosynthesis, show less of a response to elevated CO2 than do other types of plants. Rising CO2 is therefore likely to have complex effects on the growth and composition of natural plant communities. -- Steven A. Edwards, a policy analyst at the American Association for the Advancement of Science, quoted in the New York Times. The article also says that US federal government of basic science has fallen from $40 billion in 2009 to $30 last year, and that private donors now account for about 30% of MIT's research funding. Worth reading. Is it better to tolerate high income inequality in the hope the rich will fund (some of) what the government can't, or have less income inequality and a broader support base for what society needs? What if CO2 Gets Really High (say, 1000 ppm or higher)? You often hear some people say that CO2's effect is logarithmic, or that it's going to be saturated so that further increases in its concentration won't affect climate....but neither is true. CO2's radiative forcing near the values we're at -- a few hundred parts per million -- are logarithmic, but at higher values that doesn't hold rigorously. I've always wondered what the forcing was, and a cool new paper calculates it out to 50,000 ppmv. "Radiative forcing at high concentrations of well-mixed greenhouse gases,"
Brendan Byrne and C. Goldblatt, Geophysical Research Letters, Jan 13 2014. The paper calculates radiative forcing for CO2 from 100 ppmv to 50,000 ppmv, and finds a maximum radiative forcing of 38.1 W/m2. Methane (CH4) and nitrous oxide (N2O) are calculated from 100 ppbv to 1000 ppmv, and give maximums of 6.66 W/m2 and 22.3 W/m2. In the plots to the right, the black lines (mostly overwritten) are the new calculated RFs, the cyan line is the new fit (see below), and the red line is the IPCC simplified fit from 2001. So CO2's nnew RF is slightly higher, where the difference starts to matter around 1000 pppmv, and the RFs for methane and N2O are below the previous IPCC fits, but only at very high concentrations. In particular, there is no "saturation" of CO2's effect, at least out to 50,000 ppm. In particular, the first equation above is the old CO2 RF formula (but with a prefactor of 5.32 instead of 5.35), plus a term that goes like the square of the logarithm of CO2 concentration. (So it's like a Taylor series expansion with the independent variable being ln(C/C0)). At 1000 ppmv, the old RF = 6.8 W/m2, and the new RF = 7.4 W/m2. I don't think that the new RF expression will make much of a difference for CO2 doubling or even emissions over the next century. The differences start to become quite big as the CO2 concentrations increases above ~1000 ppmv. The RCP8.5 year 2250 CO2 concentrations are ~2000 ppmv at which point you start to see a couple Wm-2 difference from the simple logarithmic fit. Unfortunately, concentrations this high or higher cannot be discounted for long-term anthropogenic emissions. The place you see the real differences are when you look at paleoclimate CO2 concentrations. Over the past 450 million years CO2 concentrations have been as high as 6000 ppmv, or possibly higher. At this concentration your looking at a forcing of ~21-22 Wm-2 from our expression and a forcing of about 17 Wm-2 from the logarithmic expression. Differences like this should definitely show up in climate simulations. Byrne said the higher order terms for CH4 could come in if there is was a destabiliztion of methane clathrates, like might have happened at the PETM. The one place where I could see results from this paper making a significant difference in climate simulations for concentrations at and below 2100 values would be in the latitudinally resolved forcings. Several climate models of intermediate complexity do not consider the latitudinal difference in radiative forcing, instead they apply the same forcing to each grid cell. In reality, radiative forcing are quite dependent on latitude and can vary by 37-47% from the tropics to the poles. This is shown in figure 6 [above]. This is primarily caused by lower surface temperatures. The less radiation emitted from the surface then the less long-wave radiation there is available for greenhouse gases to absorb. How much of a difference this would make in the simulations is unclear though. There's a lot more to the papers, such as how to define the tropospause (the boundary between the troposphere and stratosphere), and how to handle overlaps between the different GHGs. Definitely worth reading if you like this kind of science. How Does Victor Davis Hanson Get Up in the Morning? You know, if deniers spent as much time presenting good, firm science as they do talking about the one or two times when some (usually minor) scientific finding has been found to be false (because ulcers), they might actually make a difference. Until 1982 “settled science” decreed that stomach ulcers were a result of bad diet, too much gastric acid, or undue stress. Then Australian scientists Barry Marshall and Robin Warren shocked the medical community with an unlikely thesis: The real culprit for peptic ulcers more often was infection by the Gram-negative bacterium H. pylori, a common but sometimes dangerous agent in the gut that could be treated with antibiotics. The practice of gastroenterology was turned upside down. In other words, nothing scientific is ever quite settled. which must make it very difficult to get up in the morning. I mean, how does he know the laws of electrostatics are going to provide a firm footing when he puts his foot on the floor, and that he won't sinnnnk right through to the molten core of the Earth? That he's not going to fly off the surface of the planet because, you know, gravity is not ever quite settled? That his car won't start because the laws of thermodynamics were overthrown in the middle of the night? Some pundits -- Krathhammer, Hansen and the like -- don't understand science in the least. Or how it arrives at the conclusions it does. That is to say, why we know what we know. They should have to forfeit all the many good things science has provided in their lives -- which is basically everything -- until they understand that the fundamental laws of thermodynamics, quantum mechanics and radiation aren't ever going to change. And why. They seem to be waiting around for the day when scientists say, "Oops! We were wrong about carbon dioxide all this time -- it really doesn't absord infared radiation. And all objects, like, say, the Earth -- they don't really emit radiation. We guess! Who knows? So go ahead and burn all the fossil fuels you want. Our bad!" Idiots. (And I mean that sincerely.) Worse: dangerous. History has shown that we ignore science at our peril. Of course, the Obama administration has already signaled.... it has no intention whatsoever of proposing anything like zero emissions -- that would take far more courage than any administration can possibly muster, even though they probably understand -- or at least a few people in their organization understand -- that it's necessary. Instead, Obama has proposed just enough cuts -- not much at all, really -- to keep corporate donors happy, so that Hillary or Biden wins in 2016, and to keep the environmentalists lapping in the water dish, ever-hopeful for something -- anything -- to happen.